It seems longer, but only 5 weeks ago I cycled in Brisbane. This was actually the very first time I ever cycled outside of Europe. I have been in the US often, but I never felt the urge to cycle there. I also didn’t cycle in Sydney earlier on this trip, where I did my presentation. That had to do with Australia’s mandatory helmet laws. I do not want to cycle with a helmet, but I also didn’t have the intention to break a country’s law. However, Queensland has several exemption reasons and I complied with one of these. It made cycling possible for me. And I really enjoyed cycling in Brisbane, at least after my first and only encounter with the police, who let me continue my ride, after they had established the legality of my exemption letter. Brisbane police officers stopping me for not wearing a helmet. Only to find out I was legally allowed to do that. Photo by Richard Bean. My hosts for the tour were Paul Martin and Richard Bean. They showed me the good and some of the bad of cycling in Brisbane. The weather was splendid and the Jacarandas were in full bloom, in short: we had an excellent day! I must explain that although the 7th of October was a Monday, it was a holiday. So the city was much more quiet than it would have been on a normal working day. This made a lot of difference, especially for riding in the cycle lanes. Motor traffic is allowed to drive rather fast in some of Brisbane’s streets. There are a number of different speed limits. In many of the streets in the Central Business District (CBD) the speed limit is 40km/h. But through streets have a limit of 60km/h and that is very fast for multi-lane shared space or if you are in a cycle lane that is only 90cms wide! Especially because drivers tend to see those speed limits as an advisory speed that -they think- may be exceeded by at least 10%. Some streets have a limit of 50km/h and it took an effort to get the city to lower these limits. This letter from the lord mayor shows how the speed limit on a bridge was lowered from 60 to 50km/h after cycling advocates had pointed out the speed limit was higher than usual in the CBD. On roads this quiet, a cycle lane like this is okay. But on a normal working day traffic passes you here at high speed and that makes it a completely different experience! The rate of cycling in Brisbane is very different for different parts of the city. It ranges from 10% to only 1% or less. This has to do with how much infrastructure there is, as Richard recently explained in the Brisbane Times. 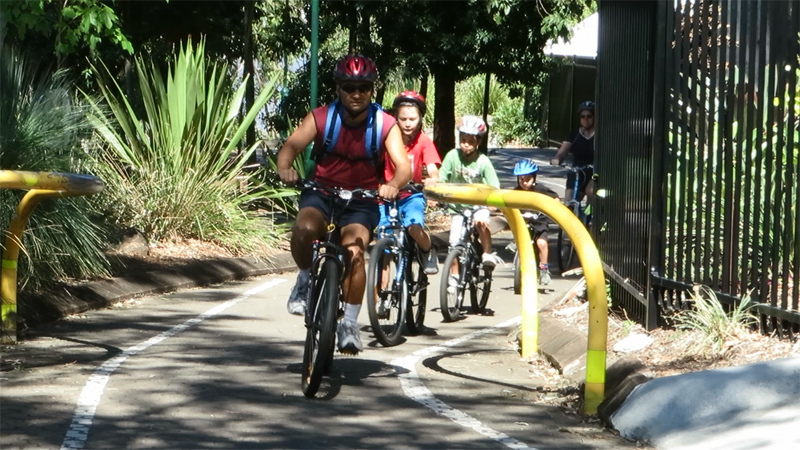 A family of 5 cycling in Brisbane. 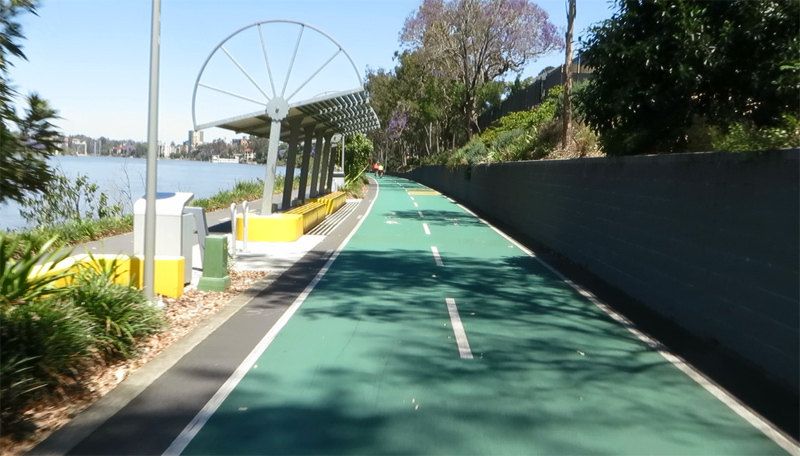 Many people use this perfect cycle route to get from some of the inner suburbs to the CBD for their work for instance. But if you are not so lucky and you live elsewhere without access to that route, cycling on the bigger streets of Brisbane is a very different experience. Cycle lanes can feel very unsafe with the higher speeds. Some of the separated cycle paths I saw were also not up to the world’s best practice. They were constantly interrupted by driveways and side streets and it was completely unclear who had the right of way at these points. This makes riding there very unpleasant and even dangerous. Wearing protective gear won’t do anything to improve your safety. It is the infrastructure that makes you safe. It is also infrastructure that makes cycling pleasant. I saw very good cycle paths, but especially the junctions leave a lot to be desired which makes the good infrastructure disconnected. With an increase of cycling of 7.5% per year in the last decade, the city really needs to improve some of the cycle routes. As my video also shows: the demand is there! Cycling in Brisbane, my experiences in a video. Some of the footage was filmed by Marijke Wagenbuur-Ketelaars, some by Paul Martin and some of the pictures are by Richard Bean. A big thank you for these latter two for showing me around Brisbane on a bike and for filling me in on cycling in Brisbane! I’m from Melbourne, and I have noticed that our cyclists are pretty terrible riders. You see people ride on footpaths. Bikes are ridden on the wrong side of the road, go through red lights too frequently. Another problem not so obvious is that most of us don’t even know the rules for using a roundabout. If you ask any cyclist or even a motorist about the rules for using a roundabout, they’ll tell you it’s give way to your right, actually the rule at unmarked four-way intersections. But the actual rule here is give way to those already on the roundabout. There is no legislation specifying priority when they arrive at a roundabout at the same time, roundabouts being designed to avoid such conflict. They also aren’t familiar with the very definition of giving way, which is don’t get in the way. When you approach a roundabout, you don’t get in the way of anything on the roundabout, and try to arrive at the same time as or later than anything approaching for your left (right on mainland Europe), when turning right at a roundabout, also try to arrive at the same time as anything approaching head on, or afterwards. In Melbourne we have too many shared paths and not enough bike only paths. And the few bike only paths we do have get misused by pedestrians. We do have some dedicated bike lanes on the side of some streets, such as the portion of Swanston north of the CBD. I would like to see bicycles being permitted to turn left into them on red lights, in addition to greater separation of bikes and pedestrians, but apart from that, our lousy cyclists could very much do without major rule changes. Hey Mark. I’m a fan of your videos. My wife and I completed a bike tour of the Netherlands last month because you inspired me to go there. Australian Parliament is currently accepting submissions from people about removing mandatory helmet laws. Mine can be found under submission number 31. I believe your opinion would be important should you choose to write your own submission. I’ve been cycling in Brisbane all my life (live here but was actually born in Holland). I couldn’t agree more with your video. Especially about the stupid banana bars. They don’t all have reflectors on them, so I’ve seen plenty of people fall off their bikes hitting them in the dark when they are invisible, even with bicycle lights. Winging Dutch – Eff off back to Holland if you don’t like it here!. Wear ya bike helmet too you stupid pillock! How many kids will end up brain dead from riding bikes without a bike helmet if they see you doing it? Take some fricken responsibility. our country would be better off without tourists like you – I’d have booked you – exemption letter or not, pity the copper didn’t do us all a favor & just deport you. Asshats like you should take the bus!. Note to self – don’t visit Holland if its full of pillocks like this one. Hopefully my sentences aren’t too complicated for you to understand, so bear with me. – Holland isn’t a country. – Whinging is spelt with an ‘h’… I gave up on your other grammatical & spelling errors. – If there was a place where ‘stupid pillocks’ should be sent I will be happy to pay for your airfare – first class, one way. You’re welcome. Mark was riding LEGALLY, fully complying with Queensland Road Rules. I suggest you go and read those regulations thoroughly before unleashing your inner bigot. It may surprise you to know that the Dutch (who live in a country called The Netherlands) have the safest cycling in the world, due entirely to creating a safe cycling environment. They see helmets as a distraction and safety theatre. The Dutch make cycling safer… whereas you’d rather just attempt to make crashing safer. The Dutch children are also the *happiest* in the world and they’re not dropping off like flies because they ride bicycles without helmets… and neither were Australian children prior to the invention of the helmet, let alone prior to the ridiculous law that compels people to wear them or face a hefty fine. I’m still alive – maybe not wearing a helmet saved my life? If you have children and you want them to wear helmets, then wear one if you want to set that example for them – they’re your children. However, why should the rest of the adult population have to bend to the whims of inept parents who not only require everyone to be ‘playing along’ with their silly theatrics, but also require laws to enable them to control their children (as if that actually works!)? Let parents do the nannying, not Government. I’m also so glad you won’t be visiting The Netherlands. That country will do quite well without your presence. I might add that in the video I see at least three children with helmets worn in such a way that in case of an accident they wil almost certainly strangle the wearer. So much for safety consciousness. Wonderful blog- shame about the bile from Ian- sort of like finding some dog poo on your tyre. “Pillock” is a derogatory term used by “chavs” from England and certainly not used by Australians. So I think we have a “whinging Pom” here, trolling thru the internet, and spreading his vile, pathetic abuse in an attempt to distract himself from his inconsequential, unhappy existence. But I suppose every country has its losers. Ignore him, and thanks for an excellent blog. You don’t need to have an exemption letter. You just need to state clearly that you do not consent to their jurisdiction or questions about the matter and that is them finished. Always refuse to give them your name. that is taken as a form of consent. wow, really? is that a Qld thing, or all states? have you done this? if so, what is the reaction you usually receive? No, this is not possible in Queensland with this particular law in the Transport Operations (Road Use Management—Road Rules) Regulation 2009. Failing to give your name, after having broken a road rule, can result in you being detained until they are able to identify you. Sorry mate, but now your quoting what? A regulation? If you want to be a child of the state, that is your choice. My best guess is that you are either a solicitor or a police “officer” and rely on acts of theatre, sorry, parliment, to turn your corporate profit. Crank, no I haven’t done this as I choose to take personal responsibility and wear a helmet, not because of a fraudulent system of statutes masquerading as law. I also respect the choices of others not to wear one and see no reason they have to. Mark, I always love hearing or seeing your critiques of bicycling in cities outside of the Netherlands. 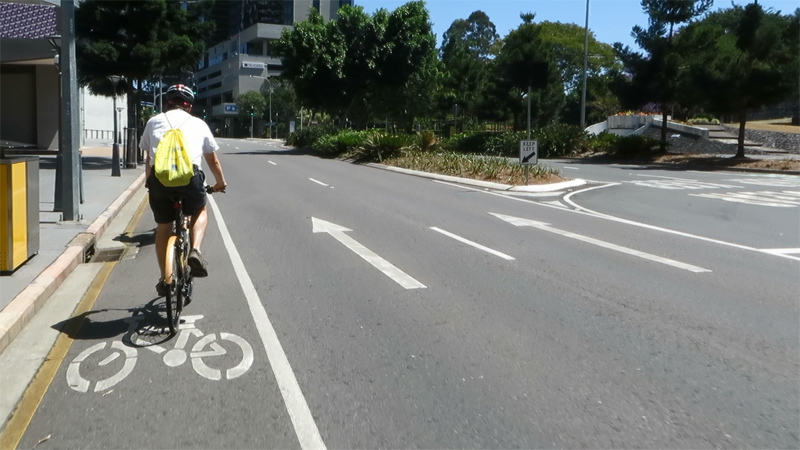 Cycling infrastructure in Brisbane looks very similar overall to the U.S., from the green paint, to the bike symbols in the bike lanes. Use of green paint on the cycle path is an interesting treatment in how it relates to what can be done in the U.S.
An example is the 16-ft wide, 12-miles long Orange Line BRT mixed use path in Los Angeles which does not have texture or colorization to divide it, but it has physical separation for bicyclists and pedestrians at one bus station. There is also symbols of pedestrians and bicycles and striping to show who goes where. None of this seems to work in keeping the cyclists and pedestrians separated. A big advantage of using low cost and easy to use paint or thermoplastic is that you can quickly obtain space for bicycles and pedestrians. Then you can go back later and upgrade with more permanent solutions. Striping from planning to finish can take two weeks versus taking months or years to build a cycle track or bike path in the U.S.
Having a economy that is still in the midst of a recession causes a decrease in driving and increases the odds of reallocating some of the space devoted to cars over to bicycles. A bicycle sharing system is most effective in large cities that have high population density and where its difficult to store you bike inside your building due to having to walk up stairs. A high theft rate and lack of room outside can also deter cycling. New York City has all of these problems for owning and using your own bike. After viewing the video, is it any wonder why over 95,000 people in New York City signed up for a annual membership with Citibike in its first five months with only 6,000 bikes available? 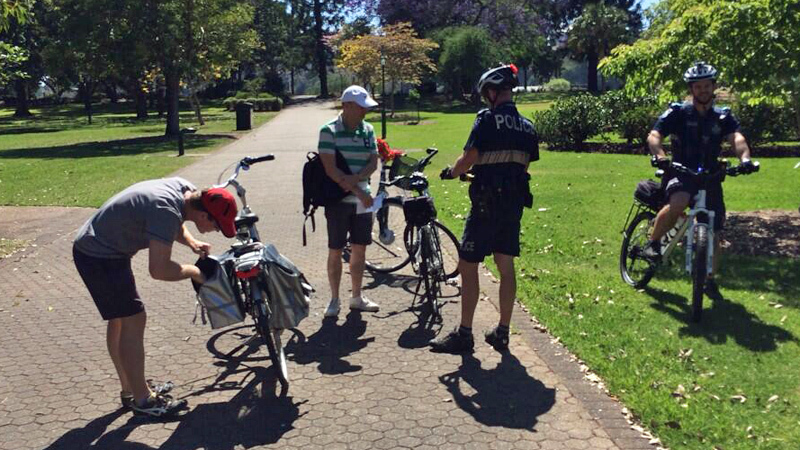 Why don’t all cyclists in Brisbane carry an exemption letter? Intrigued as to your exemption … did you manage to claim as a Netherlander you had a religious objection to wearing a helmet?? By founding his own religion which states that worshipers believe that helmet wearing are sins perhaps, and maybe depending on what Mark does otherwise, saying that worshipers are not required to practice antihelmetism alone. That would be funny though if he did that. I am frequently stopped by the police for not wearing a helmet in Brisbane. Given our climate I choose a wide brimmed hat instead. I too have an exemption letter, and am required to mention or show it with regularity. I think Brisbane would have to be one of the cities where helmet wearing is strongly enforced by the constabulary. 99% of my daily commute is on bikepath, shared path or footpaths, yet I am still stopped to ensure my safety. My record for being “pinged” as I call it, is 20m or 50seconds, from getting on my bike and being pulled over. Ridiculously, I have had lights and sirens on me mulitple times, when I am riding at a blistering 14km/h. No idea why they can’t just pull up with a window down and ask me to pull over. Sounding your horn behind a cyclist is actually illegal in Queensland, nothing about sirens though! given the cancer rate here, definitely would be safer for peoples health to enforce a mandatory wide-brimmed hat law! Thank you for this post. It seems very similar to Melbourne. We have a rather nice cycle path around the Yarra river – although it is shared with pedestrians, and a lot of dogs 🙂 – but direct routes around the city are totally lackluster, and frequently dangerous. There is anonimosity towards cyclists who turn left at a red light, while adhering to the speed limit in a car is totally optional, and stopping in bike boxes is the norm, as is parking in bike lanes. Police do not enforce any of this against motor vehicles, but love to stop cyclists sans helmet. Furthermore, as I understand it, some states allow for a 10% error in either your speedometer or the speed camera before you are fined, conseqently is common practice for drivers to intentionally drive 10% to 10km/h over the limit – I don’t know if this applies in Queensland. If you look up the Australian bicycle blackspot site/app (started by the Greens) you see much tragically laughable bike infra. Fabulous post, Mark. Thank you for your observations on cycling in Brisbane and lovely to see you again! What did your exemption letter say, that you were a member of the Church of Sit Up Cycling? Considering that you weren’t a pedestrian in a pedicab, I can only assume a medical exemption? Is it not required to disclose to the police officer details of this exemption? Indeed, the police officer is not allowed to ask about medical details. That is between the doctor and the patient. Perhaps he had a bad gash on the top of his head and he said wearing a helmet would make the gash worse. I don*t know. Fun to speculate though. 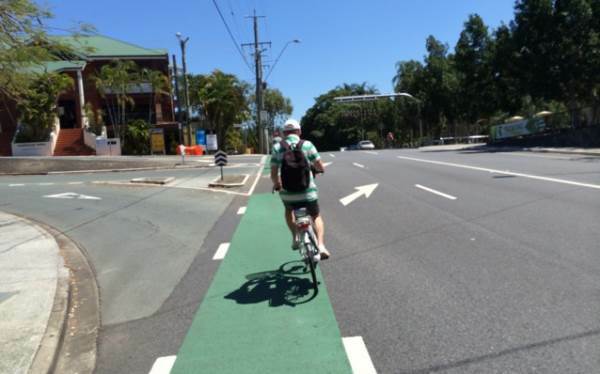 This entry was posted on 14 November 2013 by Bicycle Dutch in Original posts and tagged Australia, Brisbane, infrastructure.